This is the Jose Rizal Shrine in Barangay Casat, Bayombong, Nueva Vizcaya. This 7.5 hectare complex serves as a tribute to Filipino heroes as well as a significant cultural and livelihood center. It also served as the 4th Pit Stop of the Race. The 5th Leg begins in the late morning with teams going to the terminal to catch a bus to Baliuag, Bulacan. 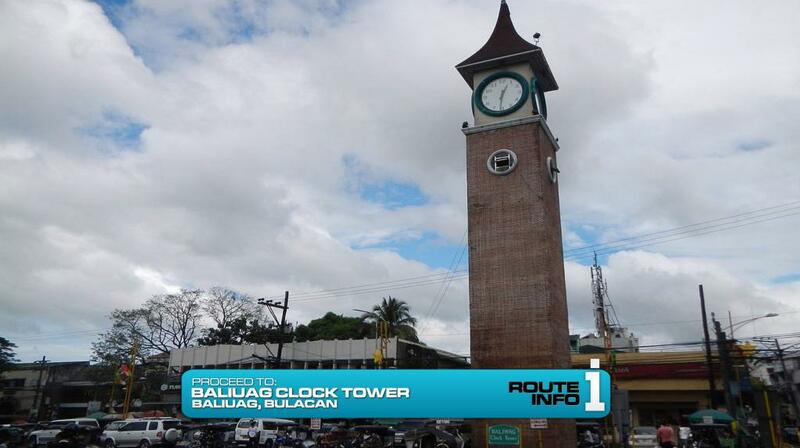 They will find the cluebox at the Baliuag Clock Tower. And teams will immediately find the Detour. Baliuag is known for its colorful festivals and for this Detour, teams will get right in the middle of the festivities. For both sides of the Detour, teams must make their way by tricycle to Baliuag Town Proper. 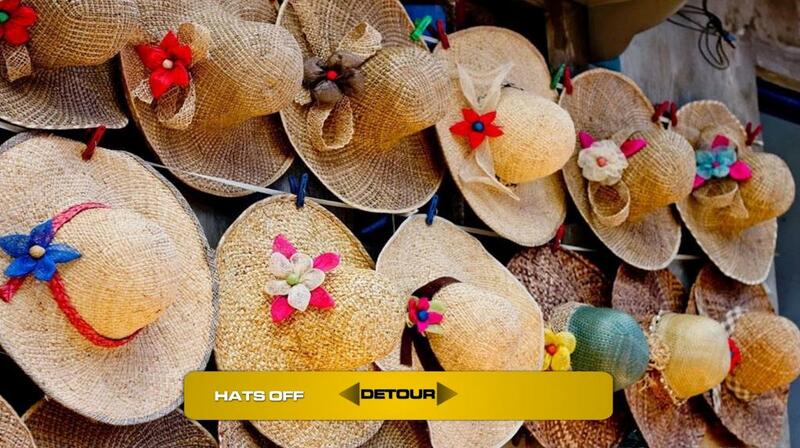 In Hats Off, teams will choose two hats, each with a similar, yet distinct design and wade through more than 100 locals practicing for the local Buntal Hat Festival to find hats that match the ones they’ve chosen. Once they ask the two locals wearing those matching hats to accompany them to the dance choreographer, they will receive their next clue. 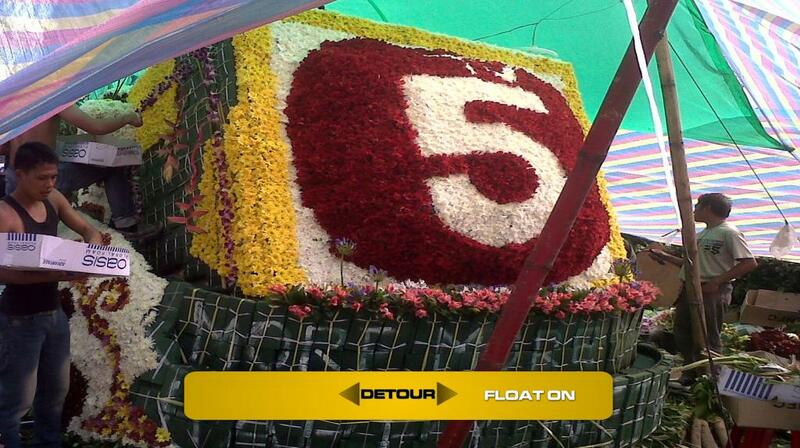 In Float On, teams must fully decorate a carroza or float typically seen during the town’s annual Holy Week processions. Once they’ve covered the float in flowers according to the design diagram and to the approval of the head decorator, they will receive their next clue. 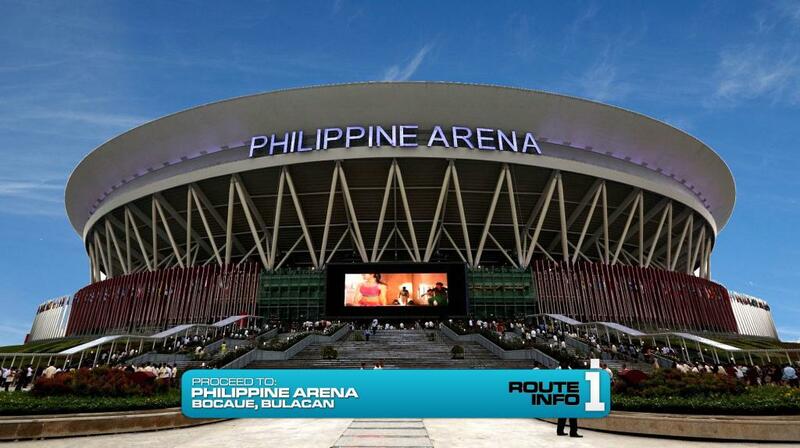 Once teams have completed the Detour, they open the clue telling them to take a taxi to the brand new Philippine Arena in Ciudad de Victoria, Bocaue, Bulacan. Darkness starts to fall and outside the imposing arena, they will find the Road Block. 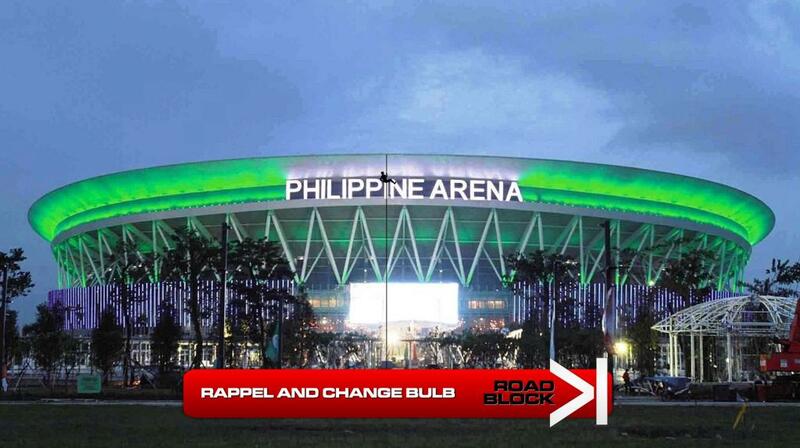 For this Road Block, teams will rappel down the facade of this more than 200 foot tall arena to change five of the color-changing LED bulbs that circle the exterior dome roof. Once they’ve successfully changed out the bulbs, they can rappel down to reunite with their partners. 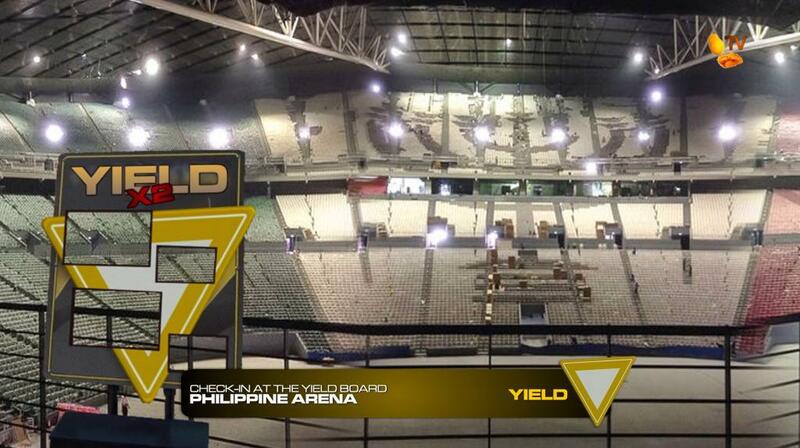 Teams will then receive the next clue pointing them inside to the cluebox on the catwalk at the front of the arena. But the clue also has a warning: YIELD AHEAD! Teams will find the Double Yield board with two hourglasses right next to their next cluebox. After checking-in at the Yield, teams can open their next clue. This brand new, 9 billion peso architectural marvel is built on more than three and a half hectares of land and can seat up to 55,000 people, making it the largest indoor arena in the world. 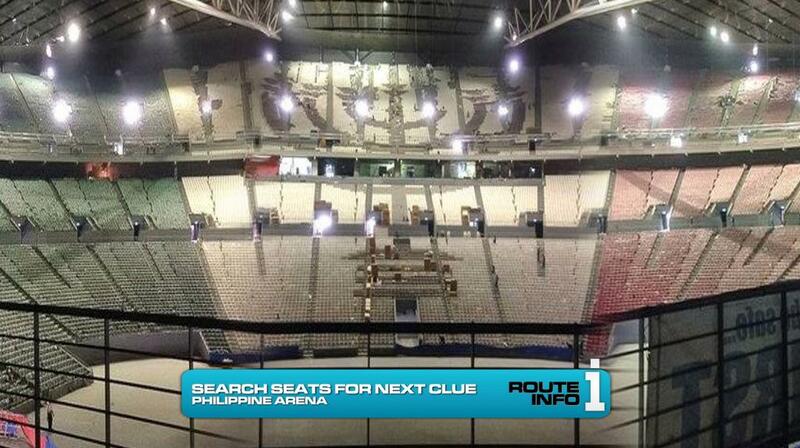 Now, teams must search the seating area of the arena to find one of 20 clues pinned to the back of the seats. Interestingly enough (hopefully), Yielded teams will be able to clearly see other teams searching the arena for the clue and could possibly even use that information to eventually find the clue faster once their Yield time has expired. 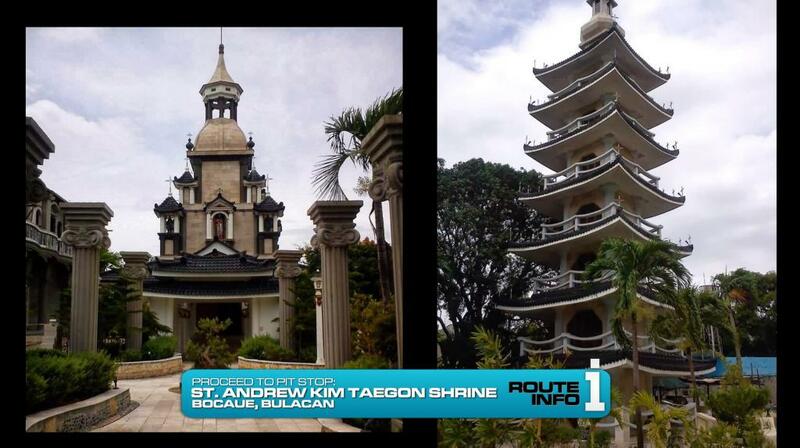 The St. Andrew Kim Taegon Shrine in Bocaue, Bulacan. 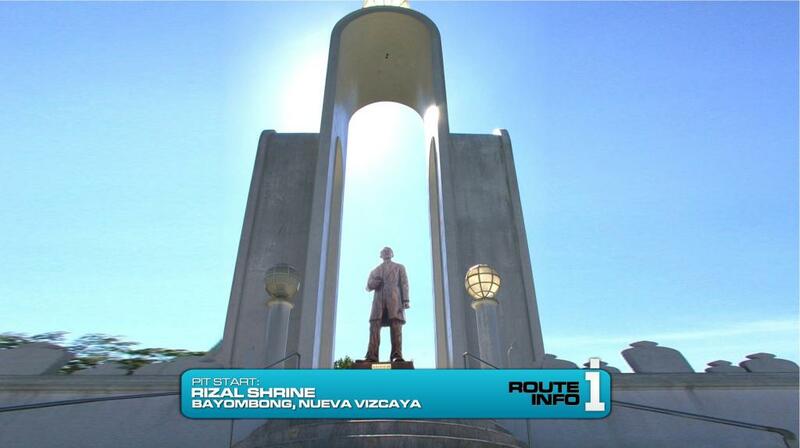 On the next Leg of The Amazing Race Philippines: DyedMangoez Edition, teams receive a huge surprise when they open their first clues. Will teams be able to adjust on the first ever Leg outside of the Philippines? Or will they end up seeing their chances at the grand prize gone with the wind?